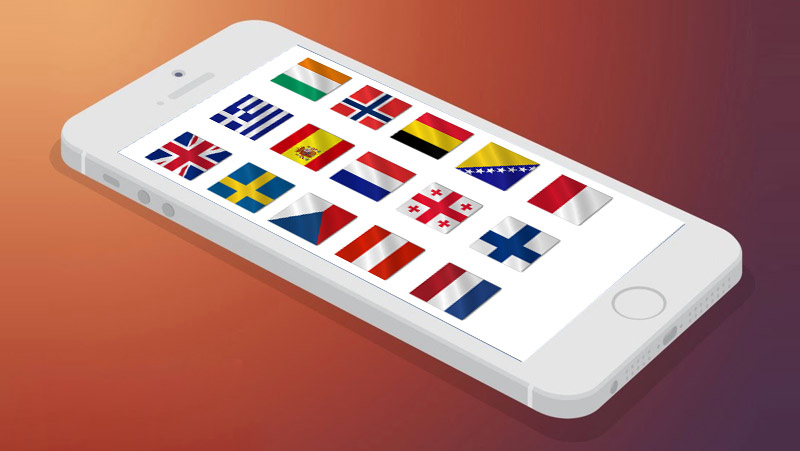 Smartphones have opened up a whole new world of language learning, and there are various ways through which they can help anyone eager to learn a new language. From apps that allow you to acquire new phrases every day, to those allowing you to get in touch with people from all over the world, smartphones and mobile phones have brought forth a new era of language learning. And with around 16% of the world’s current population owning a smartphone, the accessibility to such apps is becoming easier and more widespread as each day passes. Many factors have made learning, in general, more accessible across the world. 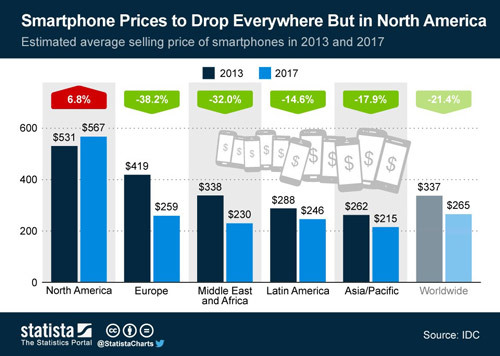 As the infographic on the right shows, the prices of smartphones in 2013 dropped considerably across the world (everywhere except in North America). Research website Statista goes on further to say that “the average selling price of smartphone worldwide will drop from $337 this year to $265 by 2017,” meaning more and more of the world will soon own a smartphone. There’s also the demand to have everything at hand – usually via smartphones – for the consumer. Smartphones, in a matter of a few years, have revolutionized the way we shop, interact, and learn. The abundance of apps now available in the App Store is growing rapidly. Apple recently announced, at its Worldwide Developer’s Conference in San Francisco, that there are now 1.2 million apps available – a similar figure to what its main rival Google Play has posted. Additionally, many developers are producing increasingly efficient and informative language learning apps, often for free. Add to that the fact that educational apps command the second highest market share (10.6%), according to Statista, with a total of 126,459 active educational apps across the two largest app stores – and it’s evident that this is a thriving market. A lot of schools and universities are now integrating apps into their teaching models because it helps extend learning beyond the traditional classroom environment. Many educators enjoy using language learning apps because they help break down a particular language to its basic mechanics, via audio translation and visual on-screen aids in which the learner can associate with a certain word or phrase. But it’s not just educational institutes that are recognizing the need to implement educational app platforms within their portfolio. Leading brands also sponsor and integrate language learning apps into their business models, in order to attract a younger demographic. In 2013, for example, 17- year-old Tom Humphrey won the O2 Think Big ‘Appskool’ competition, in which the A-level student designed a language-learning app of his own. Humphrey’s ‘Lingo-Tangible Translation’ app for the iPad was designed to make online learning easier. 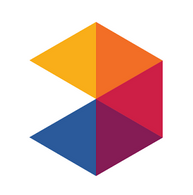 The app was developed by Golden Gekko and is now available to download via the App Store. Initiatives like this, of which mobile provider O2 is but one example, help usher in the next generation of innovative app developers. 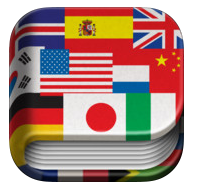 So, if you had to choose a language learning app on the market, out of all those out there available, what would it be? While picking the “right” app is ultimately determined by personal preference and learning styles, we have chosen 5 different ones that offer the consumer something different when it comes to language learning. Description: This is a fairly new app to the Google Play and App stores. However, it has a community of upwards of 35 million native speakers, who will actively help you in your interactive learning. The app utilizes crowdsourcing as an integral part of its learning system. There is a host of quizzes, listening, writing, reading and speaking tasks to aid you in improving your skills. 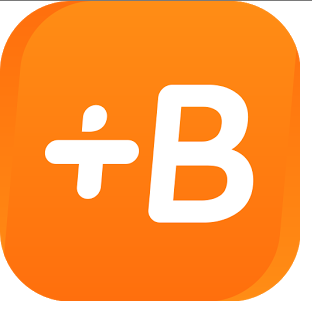 The app’s versatility and depth is where Busuu prevails among the rest of the educational apps. It provides flashcards at the early stages for the user to learn new words and a host of phrases. As the users begin to advance it then provides them with more detailed learning programs. As an addition to the standard app, there’s also a premium account option that costs $24.99 per month. It may seem expensive but through this you will get useful advice from educators via its crowdsourcing system. What’s best about this app is that it caters for all levels of learning but also offers you feedback regarding your performance, not just through automated services but also through actual native level educators. Description: An app purely designed for app users on their travels. It helps you efficiently translate phrases or words from 52 different languages. The app is extremely easy to use, however due to this being the free version, it also has its flaws. Unlike the PRO paid version, it is littered with banner ads and doesn’t have the text-to-speech functions that the paid app does. Description: We have chosen this app because it is extremely useful and employs a different technique compared with most other language learning apps you’re likely to come across. Anki is Japanese for “memorizing” and uses a flashcard system to help its users learn. It’s a relatively old app that was first launched back in 2006, but is has been refined considerably over the years. The best thing about Anki is that you can customize the flashcards to your personal preferences; you can also use it for math equations or for any other subjects you are studying. Its versatility in being able to function across many different study areas makes this a very useful app to own, and it’s free. Description: This app caters to users who want to steadily increase their vocabulary via more buzzwords such as topics areas from digital and lifestyle trends to technological terms. The app tries to tap into current, popular issues that are in the news. It also has an audio functionality backed up by visual aids. There are lots of exercises based around filling in the blanks type of sentences – the emphasis here being on improving grammar. Ultimately, this is an app designed for the beginner and is ideal for someone who is always on the go. Description: Memrise has been well publicized due to its innovative approach to memorization, and the cool thing is that it’s not solely used for language learning. Through a flashcard system that is augmented with memory tricks, also known as mnemonics, it helps the learner learn new languages and other fields such as science and history. Memrise’s primary focus is on the memorization of words. It has social sharing options and tries to incorporate fun aspects to all of its learning systems. You can also compete against other like-minded users and it is ideal for those that are always on the go. Have you ever tried any of the five apps mentioned above? Did we convince you to give a new one a try? One thing is sure, learning a language has never been made easier and more accessible than now, with literally thousands of apps and websites available at your fingertips. We’d love to hear from you, and about the kinds of language learning apps that you’ve found on the market and that you feel offers the consumer something different. Please leave your suggestions below! Hi Lindsay, as others have mentioned, it’s free for Android but unfortunately it’s quite pricey ($25) if you have an iPhone. You can also use it on your computer at home for free, so try it out if you get the chance! I really like anki! I think it’s the best spaced repetition software out there. I’ve used it on my laptop daily for well over a year, and I use ankiweb on my phone. I just wish the app was free – or at least more reasonably priced – for iOS. I’m curious Stephanie, what do you find better with ANKI than Memrise? I love anki! But it’s only free for android. It costs 25 dollars for a iPhone, which is *very* expensive for an app – especially when compared to the 0 dollar price tag for the android version. I haven’t tried Busuu yet – it’s on my list! Good point Stephanie. I do think Anki is a very good flashcard app, but of course $25 on iOS is fairly expensive for a flashcard program (especially given that it’s free for Android, as you pointed out). Anki can also be used for free on computers though, and I really like their pre-made decks which you can download for free. Anki for iOS is unbelievably expensive: $25! I have found that with Memrise I don’t really need ANKI. Has anyone found functions in ANKI that Memrise can’t handle? I’ve been trying to think of some, but haven’t come up with any. The memrise interface is so much better and the availability of existing “decks” or “cards” is much better managed than ANKI. Hi Jared. I haven’t used Memrise extensively, so I’m not familiar with all of the app’s/website’s functionalities, but Anki has a lot of options for tracking your progress, such as graphs that track your study sessions over time, etc. Memrise is also restricted to studying through memory techniques (which is great, of course), whereas Anki can be used in any way really. I think both can be used in different ways and ultimately, they can complement each other when used the right way. Sounds like I should play around with Anki a bit more. What do you mean by Memrise restricts studying through memory techniques and Anki can be used any way? Can you give me an example? I didn’t know about the tracking in Anki so that’s definitely something Memrise doesn’t show. Well I mean that Memrise is all about mnemonics, isn’t it? It’s essentially a crowd-sourced app where you can learn new words through the use of memory techniques. While I think it’s definitely a good thing, maybe it’s not for everybody. Those who prefer memorizing stuff, say, strictly using photos instead, or perhaps audio recordings, might find Anki more suitable. I had the same doubt as you about Memrise being able to manage photos as the base for flashcards, so I wrote them and asked. They responded quickly with a detailed explanation including screen shots of how to do it. I’m going to give it a try to see how it works, compared to Anki. As for audio, Memrise definitely manages that. I spent a little time with a Morse code course where you need to hear the sound of a letter and then identify which letter it is. That’s great to hear Jared, thanks for sharing this info with the rest of us. I’ll definitely check it out. Do you know if Memrise, similarly with Anki, can have decks on multiple devices (i.e. smartphone, PC, tab) and sync the decks automatically? I’ll have to download the app as I’ve only used Memrise on my computer so far, so I’m curious to know how it looks on a smartphone. I’m not specifically sure for each device you mentioned, but they have an Iphone app that I use. It syncs with my account, so it’s up-to-date for the words and courses I’m working on. I haven’t explored using it much, since I prefer the computer version (there are some differences in how it shows you and how you practice words), but it will definitely work fine if you’re looking to use it to fill in 5-minute gaps as you go throughout the day. I wouldn’t use it for a 30- or 60-minute session though. so you and anyone else can see how it works. While I think Duolingo has its strengths, I think it has a lot of flaws as well. Which is best, no typing decks or typing decks? I am a huge fan of Memrise. It helped me break the ice with Russian and with improving my French and Spanish vocabulary. I do agree with you about the flaws with Duolingo. I found it to be very limiting with its focus on low frequency vocabulary. But I think it can serve a purpose in making language learning fun and accessible for people who have not been exposed language learning outside of a classroom environment. Yes Memrise is great! I like their platform too, it’s very user friendly. And in regards to Duolingo, it’s true that it makes language learning fun and accessible, but it would just be nice if they taught language in a bit more inductive manner and with useful, high frequency sentences. What about Innvovative Language 101 and Duolingo? I’ve tried them both and I like them. Has someonle else also done it? As far as Language 101 is concerned, I’ve never heard of it. I’ll try to have a look at it. Have you personally found the app very helpful? What exactly does it do? Sorry, Had I barely published my comment I saw your review on Duolingo. Regarding Innovative 101, I’ve just signed up for a one-year Japanesse course with them. They have a lot of tools and easy-to-understand short lessons. They teach hiragana, katakana and kanji lessons. I tried Innovative 101 Polish, but the vocabulary cover much travel and daily issues. I found out better resources regarding Polish. I’ve used all of these, I still like Duolingo much more. I find Duolingo very enjoyable, addictive. Also if you do 1 Pimsleur lesson a day and 1 Duolingo “box” (chapter) a day and do an ocasional review, you’ll end them around the same time (in 4 months), and the’ll give you a great foundation to the language. As you do both methods, you will see the same content in different contexts. You will be doing Duolingo and have many “a-ha!” moments, when you find a word you knew only by sound through Pimsleur, then you think: “hello word, now I know how you look like” – which is a very exciting and memorable process. Next step would be Assimil I think, where now you go to the next step to solidify: learn to think in the language. In Assimil you only hear the target language, over and over again. The texts are in the target language, but you can reference your own language quickly whenever you don’t understand something. It will repeat what you’re already studied, so you don’t forget it. After that I think it’s jumping to real content (movies, series, comic books, news), starting in easy stuff and progressing into more and more difficult stuff. For advanced level, reading novels, cause novels have that extra vocabulary, beyond the first 3000 words.